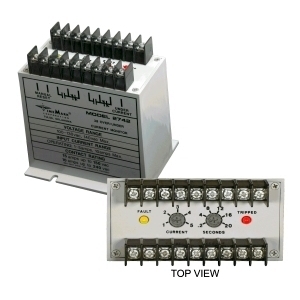 The Model 2742 3-Phase Over/Under Current Monitor is designed to monitor the current level of a 3-phase line or to compare the currents of three single-phase lines. The Model 2742 is factory-set as an over-current monitor; that is, if one or more current inputs rises above the trip level, the internal relay will de-energize. Adding a wire between the UNDER CURRENT terminals on the case will cause the Model 2742 to sense a decrease of one or more current inputs. An adjustable trip delay of 0.2 to 20 seconds will prevent nuisance tripping. The current trip point is adjustable from 1 to 5 amps, and matching current transformers are available to extend the current range of the monitor. The Model 2742 will automatically reset when the current fault is corrected. An external manual reset can be added by installing a normally closed switch between the terminals marked RESET. 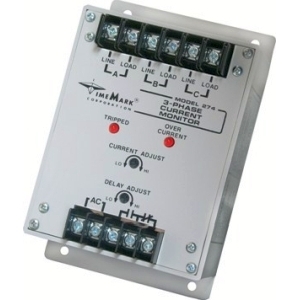 The Model 2744 3-Phase Over Current Monitor is designed to monitor the current level of a three-phase line or to compare the currents of three single-phase lines. If one or more current inputs rises above the trip level after the start delay has expired, the internal relay will de-energize. An adjustable start delay of 5 to 15 seconds will prevent nuisance tripping on start up. The current trip point is adjustable from 1 to 5 amps, and matching current transformers are available to extend the current range of the monitor. The Model 2744 will automatically reset when the current fault is corrected. 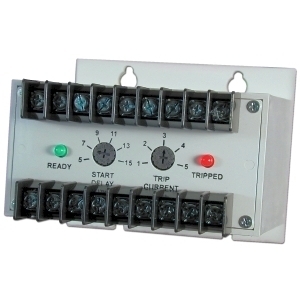 An external manual reset can be added by installing a normally closed switch between the terminals marked RESET.